A tongue thrust is an abnormal swallow. The terms tongue thrust refers to the placement of the tongue while swallowing. If the tongue protrudes past the front teeth anteriorly, or the tip and/or sides of the tongue spread between the teeth it is considered a tongue thrust. We all start our life with an infantile swallow pattern. As we develop our motor skills and oral muscles through tasks such as chewing food (around 6 months), and learning to drink from a cup (NOT a SIPPY CUP) we begin to transition into an adult swallow pattern that should be completed by the age of 6-7 years of age. In a normal swallow, the tip of the tongue presses firmly against the roof of the mouth slightly behind the front teeth, the rest of the tongue is pulled up into the palate. The lips should be closed with the teeth slightly touching. There should be NO additional muscle movements or contractions from the chin, mentalis or obicularis oris musles. 80% of tongue thrusters have an airway problem. These problems can include snoring, sleep apnea, clenching/grinding, nasal blockages, and enlarged tonsils or adenoids. Serious dental problems such as open bites and cross bites can also develop from the improper function of the tongue and muscles used when swallowing. FYI open bites often lead to TMD due to the lateral shifting of the jaw in order to chew. (Breaking through the gum) from tongue pressure. I see this every day in the dental field. Parents are concerned that their child’s tooth or teeth are not erupting quickly enough. More often than not when I check the childs swallow pattern, they have a tongue thrust! The tongue propelling forward instead of remaining behind the teeth is a constant force that can and does interfere with tooth eruption. Incorrect tongue posture is often the reason for misalignment, crowded teeth, cross bites and open bites. Bite problems account for nearly half of orthodontic patients. This problem may lead to difficulties in biting, chewing, swallowing and TMJ dysfunction. Teeth are surrounded in all directions by muscles and forces. It only takes 1.7 grams of pressure to move a tooth. The action of our tongue, cheeks, and lips can be hundreds of grams of pressure. Muscular imbalances are the leading cause of needing orthodontic treatment. 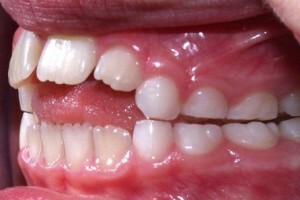 IF not corrected then they remain and can lead to orthodontic relapse. Think about it. If you have dysfunctional habits that CAUSE crooked teeth, a cross bite, or an open bite, then they aren’t going to magically disappear once you have braces. Eventually your teeth WILL begin to shift again . All to often I see my adult patients going through braces 2 or 3 times. The reason is because their HABITS causing the need for braces were never addressed. Myofunctional therapy ADDRESSES the underlying cause, not the symptoms. Often the most obvious symptom of incorrect oral posture involves the muscles of the face. A dull, sluggish appearance and full, weak lips develop when muscles aren’t operating normally. Constantly parted lips (with or without mouth breathing) also signal this disorder. A person swallowing incorrectly will often purse and tighten the muscles of the cheeks, chin and lips—a symptom known as a facial grimace. This can give the chin a knobby appearance, known as a chin button. Habitual sucking of the thumb or fingers may also cause a swallowing problem, misalignment, crowded teeth, cross bites and open bites. Thumb sucking pushes the tongue into an unnatural position when swallowing or resting, which can damage the teeth and dental arch. Correct positioning of the tongue and lips can also be difficult when this occurs, leading to an improper functioning pattern. A person with abnormal oral muscle patterns may suffer a lisp or have difficulty articulating sounds. If muscles in the tongue and lips are incorrectly postured, that can prevent a person from forming sounds of normal speech. Temporomandibular Dysfunction (TMD), headaches, grinding, or clenching of the teeth. What Can Cause a Tongue Thrust? What are the Signs of a Tongue Thrust? How can a Tongue Thrust be Corrected? Correction of a tongue thrust may be achieved through Myofunctional Therapy. Specific exercise techniques are taught and practiced to re-pattern the tongue muscles and achieve desirable results. The exercise program consists of weekly one on one sessions and daily home exercises.